The hip & pelvic muscles are important for stabilising the body and for the function of the legs. See more about the different muscles in the hip and pelvis, their uses, and exercises to strengthen and stretch them. 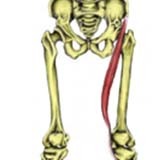 The Tensor Fasciae Latae (TFL) is a small muscle which attaches inferiorly to the long thick strip of fascia, known as the iliotibial band (ITB). Origin: Anterior Iliac crest and ilium. Insertion: Lateral condyle of the tibia via the Iliotibial band. 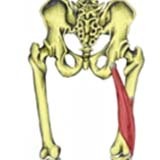 Actions: Flexion of the hip. Hip abduction. Daily uses: Keeping one foot in front of the other when walking. Example strengthening exercise: Standing hip abduction using a resistance band. Example stretches: Outer hip stretch. Standing outer hip stretch. When running the hamstrings act eccentrically to slow down the knee extension motion. Hamstring strains are common in individuals with chronically tight hamstrings or who do not warm-up thoroughly. Insertion: Upper medial surface of the tibia. Actions: Hip extension. Knee flexion. 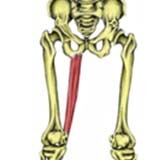 Internal rotation of the hip when the knee is flexed. Innervation: Tibial part of the sciatic nerve. Daily uses: Bending the knee to step over something. Example strengthening exercises: Knee curl with resistance band. Example stretches: Sitting hamstring stretch. Standing hamstring stretch. Semimembranosus is the most medial of the three hamstring muscles. Chronically tight hamstrings are often a contributory factor to lower back pain and knee pain. Insertion: Posterior part of the medial condyle of the tibia. Origin: Area between the ASIS (Anterior Superior Iliac Spine) and AIIS (Anterior Inferior Iliac Spine). Insertion: Anterior part of the medial condyle of the tibia. Actions: Flexion of the hip. Flexion of the knee. External rotation of the hip as it flexes the hip and knee. Daily uses: Sitting in a cross-legged position. Example strengthening exercises: Standing hip flexion using resistance band. Isometric hip flexion. Example stretches: Hip flexor stretch. Laying quadricep stretch. Standing quadricep stretch. The Rectus Femoris muscle is part of the Quadriceps muscle group. 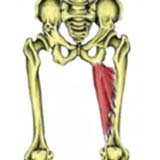 It is the only muscle of the group which crosses the hip joint and is a powerful knee extensor when the hip is extended but is weak when the hip is flexed. Origin: Anterior Inferior Iliac Spine (AIIS). Insertion: Top of the patella and the patella tendon to the tibial tuberosity. Actions: Flexion of the hip. Extension of the knee. Daily uses: Kicking a football. Example strengthening exercises: Standing hip flexion using resistance band. Sitting hip flexion – isometric. The Piriformis muscle is an important muscle. The sciatic nerve passes underneath this muscle on its route down to the posterior thigh. In some individuals, the nerve can actually pass right through the muscle. This can lead to sciatica symptoms due to a condition known as piriformis syndrome. Actions: External rotation of the hip. Hip abduction. 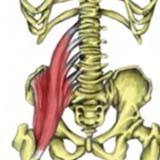 Pectineus is positioned between the Iliopsoas and Adductor Longus muscles and is part of the short adductor group with adductors brevis and longus. Origin: Upper front of the pubic bone. Insertion: Upper medial shaft of the femur, inferior to the lesser trochanter. Actions: Hip adduction. Hip flexion. Medial hip rotation. Example strengthening exercises: Isometric groin contraction. Hip adduction using a resistance band. Example stretches: Short adductor stretch. Iliopsoas is sometimes classified as two muscles, Iliacus and Psoas major, with Iliacus arising from the Ilium and Psoas from the vertebrae. Origin: Inner surface of the Ilium. Base of the sacrum. Sides of the bodies of T12-L5. Insertion: Lesser trochanter of the femur. 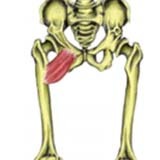 Actions: Flexion of the hip. 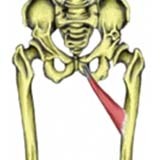 Lateral rotation of the hip. Flexing torso when the legs are fixed (e.g. lying to sitting). Innervation: Femoral nerve and branches of the lumbar plexus. Daily uses: Climbing a step. Example stretches: Hip flexor stretch. Example strengthening exercises: Isometric hip flexion. Standing hip flexion with a resistance band. 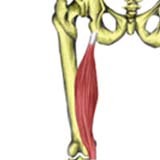 Gracilis is another muscle which works in conjunction with the groin muscles or adductors. Insertion: Upper medial surface of the tibia (pes anserine insertion). Internally rotates the hip when the knee is flexed. Daily uses: Sitting with the knees pressed together. Example strengthening exercises: Hip adduction using a resistance band. Example stretches: Long adductor stretch. 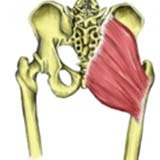 This is the smallest of the three gluteal muscles and sits underneath the gluteus medius. Origin: Outer surface of the ilium, below the origin of Gluteus medius. Insertion: Greater trochanter of the femur. Actions: Hip abduction. 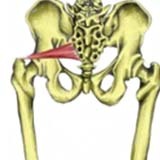 Internal rotation of the hip. Daily uses: Getting out of a car. Example strengthening exercises: Standing abduction using a resistance band. Example stretches: Outer hip stretch. Gluteal stretch. Origin: Outer surface of the ilium, just below the crest. Actions: Hip abduction. Posterior fibres externally rotate the hip. Anterior fibres internally rotate the hip. Daily uses: Stepping sideways out of the bath. Gluteus Maximus is the largest and most superficial of the three gluteal muscles which forms the rounded shape of the buttocks. Origin: Posterior crest of the ilium. Posterior surface of the sacrum. 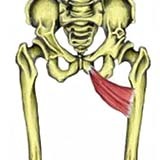 Insertion: Gluteal tuberosity of the femur Iliotibial band (ITB). Daily uses: Extension phase of walking upstairs. Example strengthening exercises: Hip extension using a resistance band. Example stretches: Gluteus maximus stretch. Related injuries: Myofascial pain in the buttock muscles. Related muscles: Gluteus medius. Gluteus minimus. 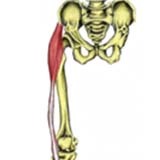 Biceps Femoris is one of the three muscles which form the hamstring group forming the back of the thigh. The muscle is often described as having a long head (the attachment from the ischium) and a short head (attached to the femur). 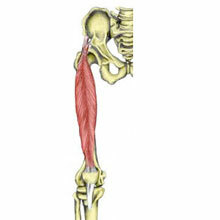 Adductor Magnus is the largest groin muscle and is one of the two long adductor muscles (gracilis is the other). It is usually described as having two parts, hamstring and adductor parts. Origin: Adductor head: Inferior ramus of pubis and ischial ramus. Adductor head: Inferior ramus of pubis and ischial ramus. Insertion: Adductor head: Gluteal tuberosity, linea aspera, and proximal supracondylar line. 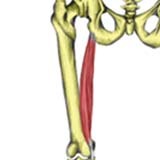 Hamstring head: Adductor tubercle of the femur. Actions: Adductor head: Adducts, flexes and medially rotates hip. Hamstring head: Extends hip. Innervation: Adductor head: Obturator nerve. Daily uses: Bringing your second leg into the car. 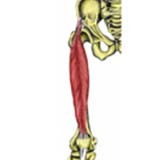 Adductor Longus is the middle of the three short adductor muscles. Groin strains are common injuries to the adductor muscles, which occur without a thorough warm-up or in individuals with chronically tight or weak adductor muscles. Origin: Superior pubic ramus, just below the crest. Insertion: Middle third of the linea aspera of the femur. Actions: Hip adduction. Hip flexion. Adductor Brevis is the smallest and shortest (hence the name brevis, meaning short in latin) of the three short adductor muscles. Groin strains are common injuries to the adductor muscles, which occur without a thorough warm-up or in individuals with chronically tight or weak adductor muscles. Origin: Inferior ramus of the pubic bone Insertion. Upper part of the linea aspera of the femur. Example Strengthening Exercises: Isometric hip adduction. Hip adduction using a resistance band. 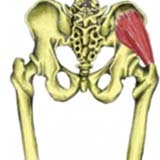 Actions: Flexion of the hip.